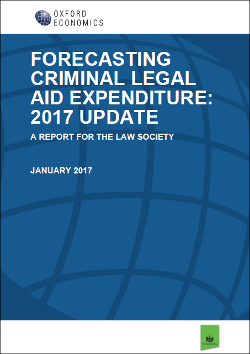 The Law Society asked Oxford Economics to refresh its 2014 study to produce forecasts of criminal Legal Aid expenditure under alternative scenarios. A number of factors could affect Legal Aid expenditure over the next five years, including the volume of Legal Aid claims, the impact of policy changes, and the composition of the caseload. We produce a baseline forecast which assumes that crime and prosecution rates remain unchanged in future years, and compare this to alternative forecasts which allow crime and prosecution rates to evolve in line with recent trends. Under both alternative scenarios, expenditure falls—by almost £20 million under the first scenario and by £111 million in the second. We have also investigated what could happen to criminal Legal Aid expenditure if recent government reforms prove effective in reducing the time taken (and therefore costs) per case. Assuming a related cost saving of 2.5-5 percent, this could further reduce criminal Legal Aid expenditure in 2021/22 by between £15 million and £34 million, under the various scenarios. © Oxford Economics 2016 - all rights reserved. Privacy / Cookies.